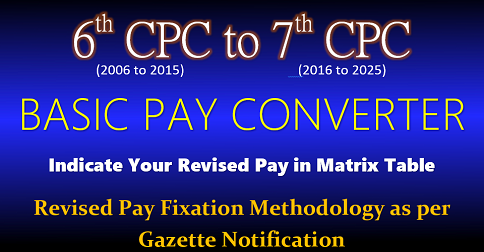 Sub: Exercising option for pay fixation in the revised 7th CPC Pay Structure, from the date of promotion or from the date of next increment from 01-01-2017 – C/o.Officials who are due for promotion/upgradation from Grade Pay 2800 to 4200 during the period from 01-01-2016 to 01-07-2017 – Request clarification and permission to exercise revised option as a one-time measure. Rule 5 – Government servant may elect to continue to draw pay in the existing pay structure untill the date on which he earns his next increment or any subsequent increment in the existing pay structure or until he vacates his post or ceases to draw pay in the existing pay structure. Provided further that in cases where a Government servant has been placed in a higher grade pay or scale between 1st day of January 2016 and the date of notification of these rules (ie. 25-07-2016) on account of promotion or upgradation, the Government servant may elect to switch over to the revised pay structure from the date of such promotion or upgradation as the case may be. 2. As per the above two provisions, a Government servant may elect to continue to draw pay in the existing pay structure until he earns his next or any subsequent increment in the existing (pre-revised) pay structure which implies that in cases where there is no promotion/upgradation between 01-01-2016 to 30-06-2016 (or between 01-01-2016 to 30-06-2017 in the case of subsequent increment on 01-07-2017) option to opt from the date of next increment (01-07-2016) or subsequent increment (01-07-2017) is available, thereby forgoing the arrears from 01-01-2016 to 30-06-2016 (next increment) or upto the date of subsequent increment say, 01-07-2017. 3. Thus, in the case of promotion/upgradation of a Government Servant becoming due before the date of notification ie, 25-07-2016, he should elect to switch over to the revised pay structure from the date of such promotion/upgradation. He has no option to opt for the next increment (becoming due after the date of promotion/upgradation) for fixation of pay in the revised pay structure. 4. Subsequently a clarificatory order is issued by Department of Expenditure (Implementation Cell) on 29th September 2016, which clarified the position further. As per this clarification, in case an employee is promoted or upgraded to the higher pay structure (in the pre-revised pay structure) he may be permitted to exercise revised option to have his pay fixed under the Revised Pay Rules 2016 from the date of such promotion/upgradation or from the date of next increment as per FR-22(i)(a)(i). 5. Thus an official who got promotion/upgradation on 15-07-2016 (in the month of July 2016), can exercise option to fix his pay under Revised Pay Rules, 2016, either from the date of promotion or from the date of next increment ie; on 01-07-2017. 6. Even after issuing the above clarificatory orders, dated 29-09-2016, it is not clear, whether an employee who becomes eligible for promotion/financial upgradation on a date after the date of issue of notification, ie, 25-07-2016, but before the date of next increment ie. 01-07-2017, can exercise option now, for fixation of his Revised Pay as per CCS (RP) Rules, 2016, from the date of promotion or from the date of next increment, ie; 01-07-2017, by forgoing the arrears from 01-01-2016 to date of promotion or 30-06-2017, thus allowing him to draw his pay in the pre-revised pay structure of 6th CPC till the date of promotion or till the date of next increment on 01-07-2017. As per the existing orders, all those employees whose date of promotion/upgradation becomes due after 25-07-2016 should compulsoily opt for pay fixation from 01-01-2016 or 01-07-2016, whereas an employee whose promotion is due in July 2016 ie; before the date of notification (25-07-2016) can opt for next increment date on 01-07-2017 for fixation in the Revised Pay structure under FR-22(i)(a)(i). Since the benefeit is extended to a section of employees who were promoted between 01-01-2016 and 25-07-2016 and the same benefeit is denied to the rest of the employee who are promoted after 25-07-2016, this is a clear case of discrimination and denial of natural and equitable justice. 7. If the option as above is not allowed, thousands of employees who are due for promotion/financial upgradation from 2800 Grade Pay to 4200 Grade Pay (in the pre-revised pay structure) from a date after the date of notification ie. 25-07-2016, will suffer a recurring loss of Rs.2800 to 3000 per month, throughout their service. Increment on 01-07-2016 42800×3%=1284, 42800+1284=44084. Next stage in the Pay matrix = 44100. MACP-II promotion from 2800 GP to 4200 GP on 05-12-2016 (one increment fixation) 44100×3%=1323, 44100+1323=45423. 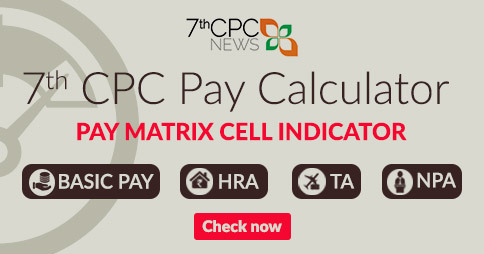 Next stage in the pay matrix level-6 = 46200. (If option allowed from date of promotion). = 19470 19470×2.57 = 50038 Next stage in the pay matrix level 6 = 50500. (If option allowed from date of next increment). Thus if no option is permissible after 25-07-2016 to fix the pay in the revised scale on the date of promotion ie. 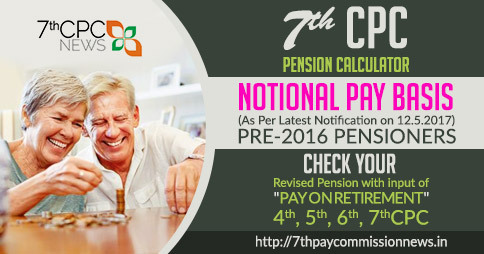 5-12-2016, then by compulsory option from 01-01-2016, the pay will be fixed at 46200 on promotion. If option is permissible after the date of notification to fix the pay in the revised scale on the date of promotion, the pay will be fixed at 49000. The difference is Rs.2,800/-. If option for fixation on next incremen on 01-07-2017 is granted, then the difference will increase further. 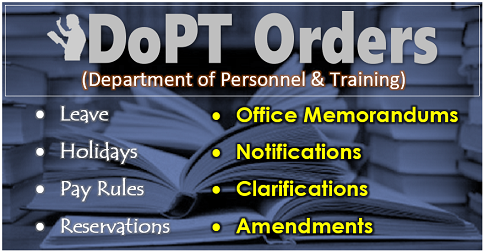 In view of the above, it is requested that the case may be reviewed judiciously and clarificatory orders may be issued, permitting the employees whose promotion date become due after the date of notification (25-07-2016) also, to exercise option for fixation of their revised pay from the date of promotion/upgradation or from the date of next increment ie. 01-07-2017, as a one time measure, thereby forgoing the entire arrears from 01-01-2016 to date of promotion or date of next increment on 01-07-2017. 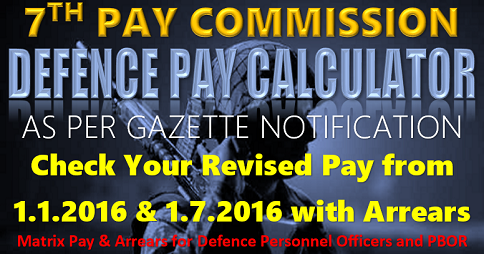 In other words, they may be permitted to draw their pay in the pre-revised 6th CPC pay structure till the date of promotion or till the date of next increment on 01-07-2017. JCM National Council (Staff side). North Block, New Delhi – 110 001 – for favourable action please. I am a posted as Jr. Clerk in Idian Railway. I already taken MACP in GP Rs2000/- under 6th CPC. My Basic Pay Fixed Rs. 32000/- on 01.07.2016 in 7th CPC. I get Promotion as Sr. Clerk in GP Rs.2800/- in L5 under 7th pay Commission in August 2016., Now Department gave me Grade Pay Difference only Rs. 800/- Previous rate of 6th Pay Commissions. So I get loss Approximately Rs.1200/- .Kindly Guide and solution.to me for this. I am a posted as Jr. Clerk in Indian Railway. I already taken MACP in GP Rs 2000/- under 6th CPC. My Basic Pay Fixed Rs. 32000/- on 01.07.2016 under 7th Pay Commission. I get Promotion as Sr. Clerk in GP Rs.2800/- in L5 under 7th pay Commission, Now Department gave me Grade Pay Difference only Rs. 800/- as Previous rate of 6th Pay Commissions. So I get loss Approximately Rs.1200/- .Kindly Guide and solution.to me for this. Sir l am posted as a electric loco pilot in chakradharpur division in S.E.Railway. Sir I request you to kindly help me and guide me for same basic. Sir I have promoted from ELPS to ELP/G (2400/- to4200/-) on 13/08/2016. According to 7CPC instructions after promotion in Jun 2016. I have lost in fixation 4500/- please tell me any instructions for promotion in August 2016. And switch over option for promotion in August 2016. In respect of the above clarification sought from the Ministry, can you please advice the right fixation and exercise of option where the MACP is due on 05.12.2016 for grade pay from 2000 to 2400. Pay as on 31.12.2015 is 10390 plus Grade pay 2000. 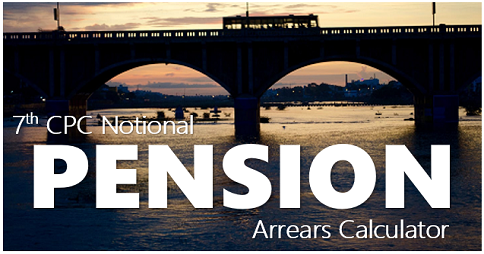 Normal increment is due as on 01.07.2016 Rs 10390 plus notional increment of Rs. 380 plus Grade pay 2000 totalling Pay of Rs. 12770 ias on july 2016. If the 7CPC fixation is sought from December 2016 should not it be 12770 plus FR 22 increment of Rs 390 plus and new grade pay of Rs. 2400 gives a new Basic plus Grade pay of Rs. 13560/- X 2.57 = Rs. 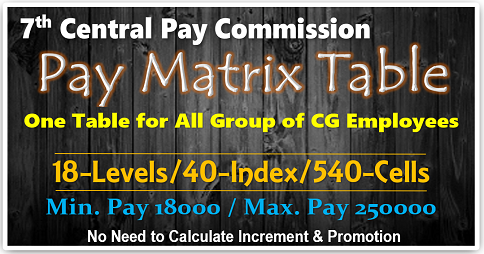 34849/- and fixation in 7CPC pay matrix for GP 2400 at level 4 which is Rs. 35300/- Kindly advice will that be advantageous. The office has fixed Rs. 35300 as on 01.07.2017 whereas it should be Rs. 36400/- as per our calculation. I got promotion on 15th February 2016 from grade pay 4200/-to 4600/- and my basic pay was Rs. 16140/- including GP .Further, I got arear Rs. 52,412/- for the period 1.1.2016 to 31.12.2016. Is it correct an my basic pay as on 1.1.2017.
whether any clarification regarding this letter addressed to the Ministry of finance has come, whether excercising option under FR still holds good in Seventh CPC. Please post the copy of reply from them if any. I got my third macp in Feb 2017 from go 2800 to 4200 in 6 th pay I and my collique were in same pay but in 7 th pay they fixed on 47600 and I on 42300 as they got map in July 16 before notification 25.7.2016 .sir now I have 5300 difference in salary pl see the matter as I m very much depress.